How many people does it take to back into and hook up a trailer? Only one … if you already have a Back-up Camera from Auto One Glass and Accessories. Stop trying to wrangle friends and family to help you back up to your trailer, you can do it without them! Auto One has a variety of Back-up Cameras in stock that will guide you straight to your trailer hitch, on the first try! Trailer Jacks: Trailer Jacks are an important part of safe towing. The experts at Auto One can help you select the safest model for your needs, considering weight and height requirements. Electric Brake Controller: A Brake Controller will also add safety to your towing. The Brake Controller will activate the trailer’s electric brakes along with the tow vehicle’s applied brakes. This allows the tow vehicle and trailer to stop as proportionately as possible. There are three styles of brake controllers: Time Delayed, Inertia Activated, and Proportional. An expert at Auto One can help you select the safest model for your towing needs. Installing Brake Controllers can be complicated, Auto One can help. Ball Mounts: Choosing the correct Ball Mount is paramount in towing safety. Keeping the trailer as level as possible will help the trailer stay in line behind the tow vehicle. There are several measurements to keep in mind when choosing the appropriate Ball Mount for your vehicle, the experts at Auto One are happy to guide you. 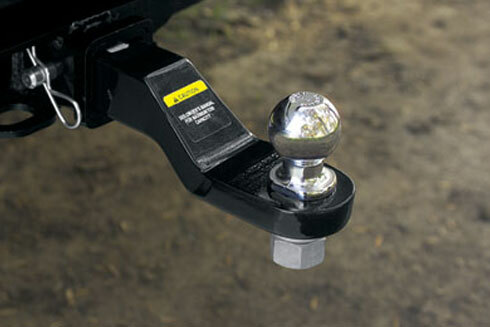 Hitch Balls: The trailer Hitch Ball attaches to the Ball Mount and then to the trailer. Choosing the correct Hitch Ball will allow the trailer to smoothly pivot when turning. The staff at Auto One can help you select the right Hitch Ball based on length, diameter and weight capacity. Hitch Wiring: Don’t leave your trailer in the dark! Hitch Wiring routes electricity from your vehicle to your trailer. Properly functioning lights on a trailer in tow are required by law. An expert at Auto One can ensure you have working turn signals and brake lights. Hitch Covers: It’s not all about safety! Hitch Covers are fun, too! Send a message to the drivers behind you – in style! Hitch Covers also help keep dirt out of the receiver and deter rust. So, how many stores do you need to visit to meet all of your trailer hitch needs? Only one … Auto One Glass and Accessories. For more details on these and other auto accessories, contact your local Auto One Glass and Accessories.